I love beer. I love cheese. Together? You had me at hello. If you love cheddar beer soup like I do (try Great Lakes Brewing Co's...it's one of the things on their menu I love) then this will make you drool. And just in time for the season of comfort food, I bring you this tasty dish. 2) Boil water and cook pasta as normal, shaving 1-2 minutes off of cooking time since pasta will continue to cook in the oven. 3) While the pasta is cooking, heat a saucepan over medium high heat and add butter. Once melted and sizzling, whisk in flour to create a roux and cook until bubbly and golden in color, about 2 minutes. Add milk and beer into saucepan whisking constantly, then add cheeses and stir until melted. Turn heat down to medium and continue to stir, cooking for 5-6 minutes while mixture thickens. It will most likely NOT thicken like regular mac and cheese because of the beer, but you want it to thicken a little bit. Stir in pepper, paprika and nutmeg. 4) Add pasta (once cooked and drained) to a casserole dish, then pour cheese over top, mixing gently to combine. 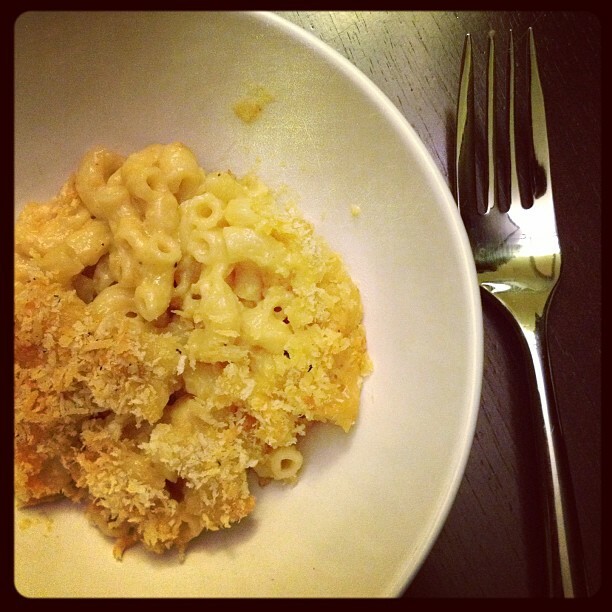 Top with panko bread crumbs and an additional sprinkle of cheese. Bake for 25-30 minutes or until bubbly and golden on top. 5) Remove from oven and let cool for 5 minutes, then top with fresh basil if you'd like. I didn't have any on hand but it would have been a nice touch! I loved the crispiness that the panko added on the top, but definitely felt that this could have used a little more cheese. The flavor was great but I definitely thought it could have been more ooey-gooey. Next time, I would probably have made a bit more of the cheese sauce by just increasing the cheese and milk amounts a tiny bit. Pop on over to How Sweet It Is for more savory step-by-step pics. Enjoy!